Wednesday was a special evening at Falmouth School this week for a variety of reasons, with the Spring Music Concert. Bright spring sunshine provided the perfect setting on arrival and the packed audience were in for yet another fantastic night, but with some subtle differences that made for a more memorable show than normal. As always, there were a wide range of performers from Years 7-11, Falmouth College students and students from our local primary schools. The twist on the night though, was the trio of sibling duets which provided some superb moments. It was a busy night for compere Reuben Hesser too, who not only guided the audience through the evening, but played in several pieces including one he had written himself. After being played into the Main Hall by pianists Theo Fleming and Andrew Cocklin, the show began with the first of the three sibling duets as Matthew and Ben Pellow performed ‘The Swan’ by Camille Saint-Saens. The Greatest Showman is still clearly a huge influence on the students and was showcased by Lily Ford and Lotte Jose during their rendition of ‘A Million Dreams’. The Brass Group were up next, led by Sara Munn, performing ‘Go Down Moses’ arr. Matt Kingston. It was the moment to shine for primary students next, who form part of the next steps ensemble, with pieces including ‘Movie Buster’ and ‘Frothy Coffee’. The Jazz Trio then took to the stage with ‘Moanin’ by Art Blakely, before the second sibling duet of the evening in the shape of Henry and Sophia Hudson’s version of ‘Swinging Shepherd Blues’. The tempo changed considerably when the Year 9 Rock Band took to the stage, delivering a high energy version of Royal Blood’s ‘Little Monster’, before a very contrasting yet brilliant performance of Ariana Grande’s ‘No Tears Left to Cry’ from Year 12 students Brooke Williams and Marcia Hammond. The third and final sibling duet of the evening came from Theo and Oliver Fleming – known as the ‘Boogie Woogie Blues Brothers’, who boasted the biggest age gap of performers on the evening at eight school years, which further highlighted the diversity of performers on the night. As the evening wound down, Year 13 College student Brooke Mitchell’s performance of Ray Charles ‘Georgia on My Mind’, showed exactly why she has been offered a place at BIMM – London’s newest music university. 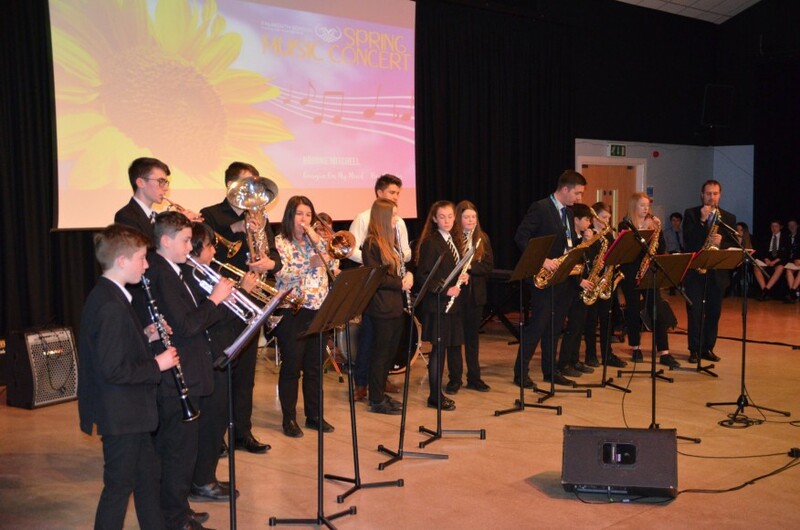 As the penultimate act, the Jazz Band served up a treat with ‘Moves Like Jagger’ and ‘Green Elephants’ – a piece written by compere Reuben Hesser, which won first place at the recent Cornwall Music Festival! The final performance of the night saw two fantastic pieces from the Falmouth Sounds Choir returning to the Greatest Showman for ‘The Greatest Show’ and a version of Rhianna’s ‘Diamonds’, which rounded off an incredible night. Head of Music, Matt Fox, was delighted with the turn out and performances. “It was fantastic to see so many people here supporting the school and the students who have been great. There is so much talent at Falmouth School and nights like this just give an opportunity to highlight it. Thanks again to all of our peripatetic support and everyone who helped put on the concert.” he said.